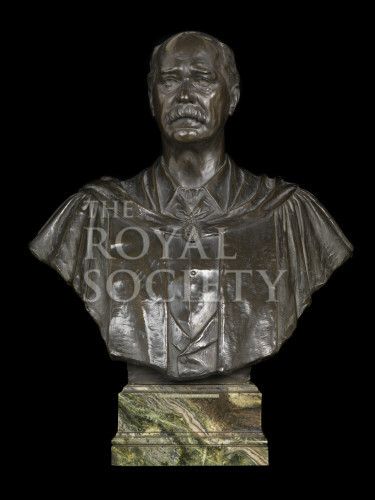 Bust of Sir William de Wiveleslie Abney wearing robes with insignia badge suspended from a neck ribbon. On a square green marble pedestal. Sir William de Wiveleslie Abney (1843-1920) was a British astronomer, chemist and photographer; he was elected a Fellow of the Royal Society in 1876. He was awarded Knight Commander of the Order of the Bath, 1900. Provenance: Donated by his daughter, Mrs A S Ransome, 1953.